Kyoto is the best city in Japan to explore the traditional Japanese arts. Here, I’ll tell you how to experience kabuki, noh drama, tea ceremony, geisha dances and geisha entertainment. I’ll also give the lowdown on museums, galleries and theatres. If you want to immerse yourself in Japanese traditional arts, you’ve come to the right place. Kyoto is the best place to check out kabuki, noh, tea ceremony, geisha dances, geisha entertainment, great museums and wonderful galleries. Note that a lot of the stuff listed here is of a seasonal nature, so be sure to check our monthly What’s On pages to see what will be on during your visit. Kyoto National Museum: This is the best museum in Kyoto, especially when a special exhibit is on. It’s a good place to familiarize yourself with the basic categories of Japanese art. Kyoto International Manga Museum: This is a must-see for fans of Japanese manga. Kyoto Municipal Museum of Art: The special exhibits here are excellent. Those held on the first floor are often free of charge. Make a habit of popping in to see what’s on when you’re in the Okazaki area. National Museum of Modern Art: The permanent exhibit here is small but excellent (focusing mainly on Japanese artists) and the special exhibits are usually very good. Museum of Kyoto: The permanent exhibit here is forgettable, but the special exhibits here are usually excellent. Rather than list individual galleries, which come and go, I’ll tell you the best areas to find small galleries. Teramachi Shopping Arcade: Try the section between Oike-dori and Sanjo-dori. Sanjo-dori, between the Westin Miyako Hotel and Jingu-michi street: There are several galleries here that welcome foreign visitors. Kyoto’s main kabuki venue, Minamiza Kabuki Theatre, is a magical place to see this traditional form of stage drama. It’s not that easy getting tickets. The best way is to inquire through the concierge at your hotel. Otherwise, if you know that kabuki is on while you’re in town, show up at the theatre relatively early on the day of a show and buy same-day tickets. Usually, just one “act” is enough (you don’t have to stay for the whole day). Read our in-depth explanation of attending a kabuki performance. The main theatre for noh is Kanze Kaikan Noh Theatre. Also, on 1 and 2 June at Heian-jingu Shrine, you can check out Takigi Noh (firelight noh) in the evening. In the spring and the fall, be sure to check out one of the city’s five geisha dances, which are held to coincide with the cherry blossoms and the fall foliage. Check out my monthly What’s On pages to see what’s happening during your visit. The best way to enjoy geisha entertainment is to make arrangements through a private tour agency like mine. Or, if you simply want to understand more about geisha culture, see my Kyoto Geisha page. 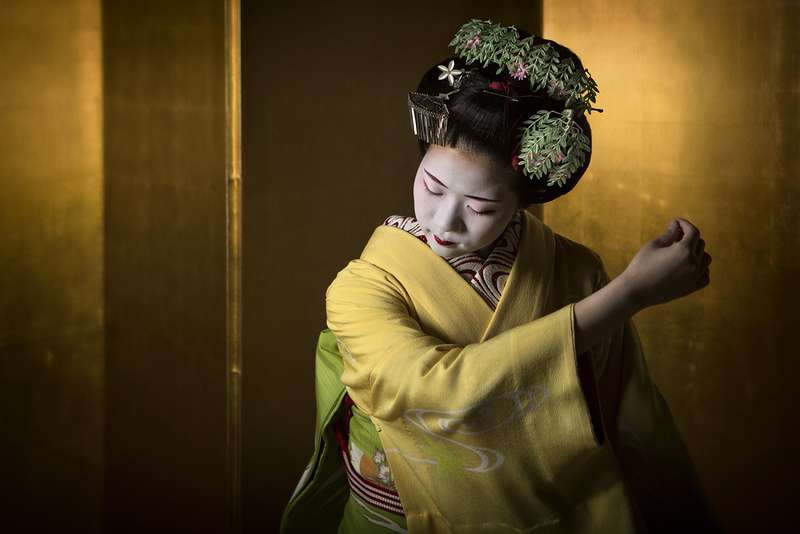 You can also enjoy an evening of geisha entertainment with a group of other diners at the Gion Hatanaka Maiko Evening. You can stay at the Gion Hatanaka too – it’s a comfortable ryokan well used to foreign guests. :: Check availability and pricing for Gion Hatanaka on Booking.com or Agoda.com. Kembu is a Japanese martial art that combines sword play with dance. At the Samurai Kembu Theater in Kyoto you can watch a performance of this traditional dance and enter the world of the samurai warrior. You can also try some swordsmanship for yourself. See our review of attending a Samurai Kembu performance. The best way to experience the tea ceremony is by making arrangements through a specialist agency like KyotoCulture.org. If you’re after a simple and casual introduction to the tea ceremony, you can also try En, a small tearoom in the Gion area.